It's been over two decades since Microsoft released its groundbreaking Windows 95 OS on August 24, 1995. Since then, we've written love letters to Windows XP and popped Listerine tabs to get that awful taste of Windows Vista out of our mouths. We then resumed with Windows 7 and 8, skipped over 9 (why? what's the story here??) and are now adjusting to Windows 10. So since most of us have seen more operating systems than presidents in our lifetime, it's worth taking a look back at the release that put Microsoft on the map. What do you remember about Windows 95? I asked various people here at Continuum, and here's what people of all ages and tech experience had to say! Yes, we were all pinball wizards when this game was released, and our thumbs paid the ultimate price. Who else remembers hitting the space bar with the determination of a teen attempting to get into an online chat room on AOL? Yeah...like anybody ever won this game. You. were. always. so. close. You had almost all of the mines mapped out, and then the slightest distraction would rattle your focus. For me, it was usually my mom calling up, "MAAAAARYYYYY, you need to let the dog out now!" Sure, it wasn't the most exciting game. There were no special effects or post-apocalyptic world visuals, but how good did you feel each time you sidestepped catastrophe and discovered the little emoticon at the top remained smiling? That Cat and Mouse Game!! Rodent's Revenge was my undoing. Out of all Windows 95 games, this is the one I was the most addicted to. As that little gray mouse I scurried to dodge the hungry felines - up arrow, down arrow ahhhhh left arrow! - and watched with relief as they'd be forced to curl up when blocked in. I'll leave you with that comforting thought rather than remind you of the sheer terror of two cats coming at you at once. Yes, you actually screamed. Don't deny it. 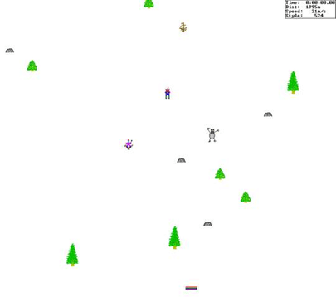 Chocolate milk, AIM and SkiFree. That's how I rewarded myself for enduring hours of geometry (I was always more of an algebra fan), P.E. and petty locker gossip - after I completed my homework, of course! The animation was crude, but we all felt like Olympic skiers gliding through the stark white Swiss Alps, narrowly avoiding tree concussions. EXCEPT SMALL CHILDREN WERE FORCED TO WATCH THEIR PIXELLATED SELVES GET GOBBLED UP BY THE SCARIEST CREATURE TO COME OUT OF THE 90S, AND WE'RE STILL NOT OK.
All fun and games aside, I asked members of the company's IT leadership what they remembered about Windows 95. I found that there was significant overlap between their responses, which all seemed to highlight the following notable features and functions. "Windows 95 introduced the START menu, which has become the ubiquitous interface that most users are familiar with and why it was such a challenge when Windows 8 was introduced with the Metro UI. Bill Gates was right when he predicted that Windows 95 would start an 'Internet tidal wave' that would be 'bigger than the PC itself.'" To this day, PC users still navigate to the bottom left of the screen to access the START menu. Yves Dorleans, Director of Information Security at Continuum, notes that the changes made with Windows 95 were fundamental and a big departure from MS-DOS. What specific changes does he recall? That's right. They don't even know how to turn the computer on. And indeed, they'll never know how it feels to rock the back clap like Lord of the Dance, Bill Gates. Are you jumping out of your chair?? What about over it? In conclusion: we should all have posters of Bill Gates hanging on our walls.